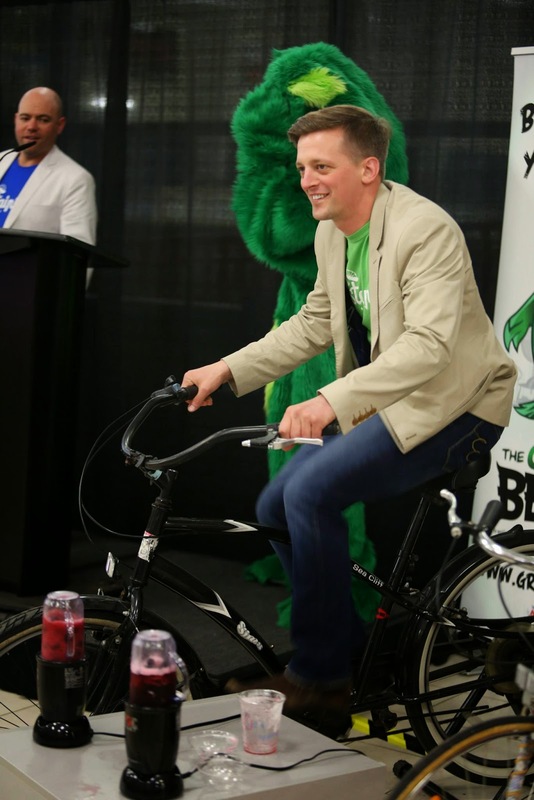 There are press conferences where things are a bit dry and without much flair, and then there are press conferences where people get hugged by large fuzzy green mascots and make smoothies through pedal power. Yesterday I attended the latter kind, and truly what a pleasure it was to once again welcome the gang from Sustainival back to Fort McMurray as they talked about their upcoming weekend event in late August. Sustainival is something I have written about before, and it has become an initiative about which I have become rather passionate. The concept of using bio-diesel to run a carnival captured my imagination the very first time I had the pleasure to meet Joey Hundert, the creative mind behind the organization, and it has never let it go. 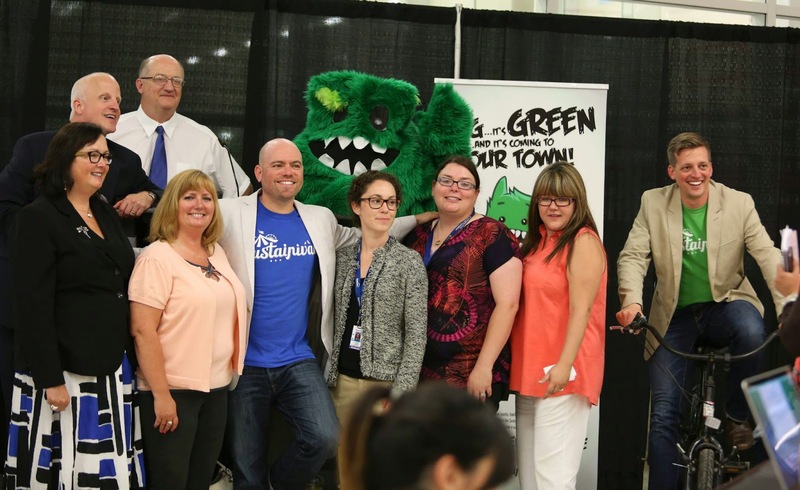 I have been incredibly proud to watch as their organization has continued to grow and develop, and as they added new initiatives like the “The Green Beast Challenge”, which was a tremendous success at the Sustainival weekend last year. 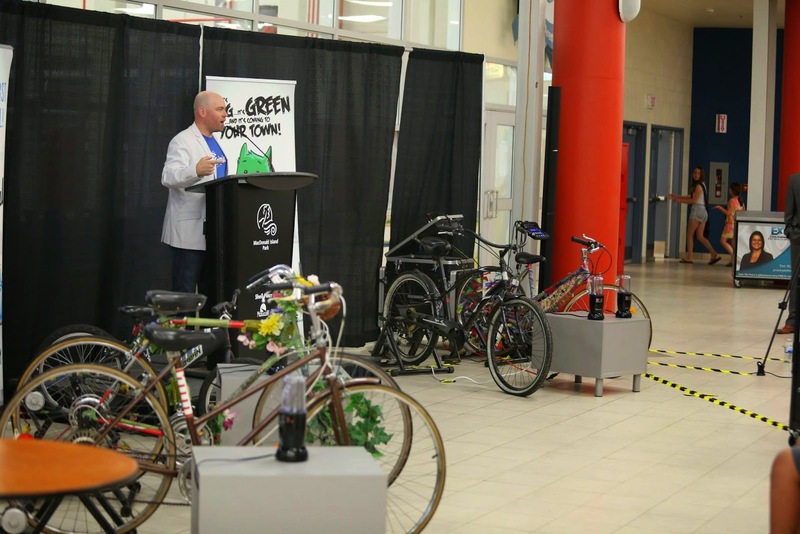 It is a genuine delight that they are coming back again, Joey and company COO Antoine Palmer (once a resident of Fort McMurray) and the rest of the Sustainival crew who will bring their brand of fun – and sustainability – to Wood Buffalo again this year. 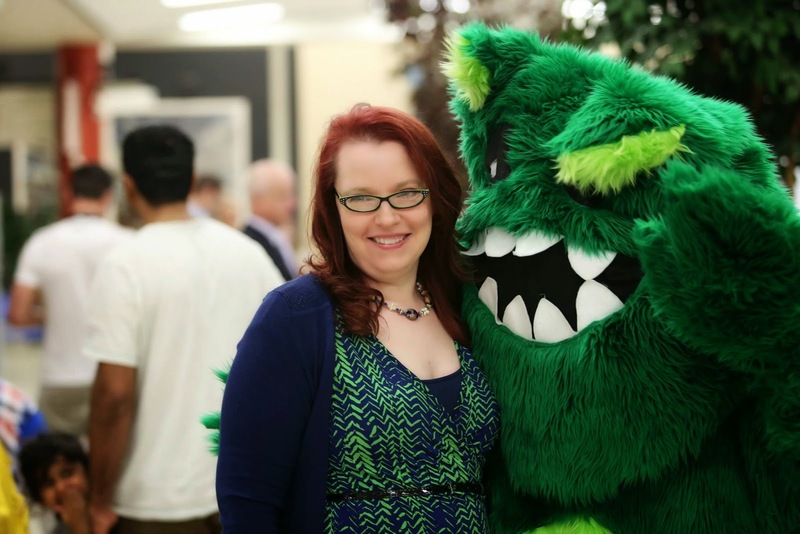 At the press conference yesterday there were the usual speeches from partners and stakeholders, although the presence of a rather large green beast punctuated the more standard moments with hugs. The end of the press conference was marked with a race to make a smoothie using bicycles equipped to power a small blender, allowing participants to use their own energy to make the treat (although I was quite pleased when Antoine presented me with a delicious Yogen Fruz smoothie he had been kind enough to make for me). It was the perfect mix of message and fun, letting the Sustainival folks announce their upcoming events, including the return of “The Green Beast Challenge” as well as some new initiatives like the Illuminate Talent Search (well described in Russell Thomas’ blog). What always intrigues me about Sustainival is their desire to continue to innovate and create, to add more value to what is already an incredibly valuable event that links fun and sustainability and shows in a very concrete way how we can think about energy in a new way. And off she went, back to playing Minecraft but with the question hanging in the air, the inquisitive nature of someone who fully intends a career designing aerospace technology but now with the added knowledge of finding innovative and creative energy solutions for things from carnivals to space shuttles. Would this have happened without the influence of Sustainival? Perhaps, but I recall very well the very first time we went to the carnival and I could see the IJB making connections in her mind, tying together the threads of the concepts of sustainability, energy and innovation. I suspect she has not been the only one influenced in this way, and so I am so happy to welcome back Sustainival this summer. One of the speakers at the press conference yesterday stumbled a bit on the word “sustainability”, coining a new phrase: “sustainivality”, which to me is the perfect marriage of the very concept of sustainability and using it new and innovative ways to achieve an end result. This summer Sustainival – and sustainivality – returns to Fort McMurray – and trust me, this is one event you don’t want to miss, whether you are just there for fun or to be part of a remarkable journey in innovation and creativity happening right in our own region.